FREE parking at Brown Field Airport: step out of your car and onto your private plane. 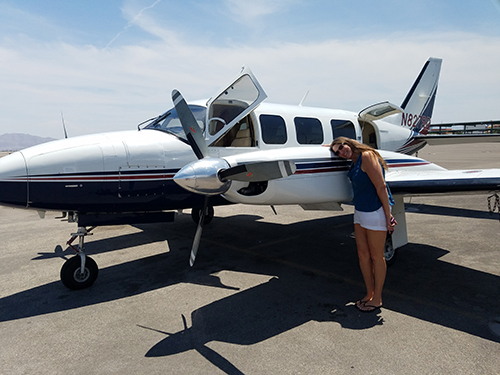 Our Piper Navajo Chieftain (named Atlahua, after the Aztec goddess who protects fisherman) is a twin-engine turboprop with executive leather. She seats 5-7 clients (TBD by passenger weights). You don’t have to be rich to travel VIP with us! 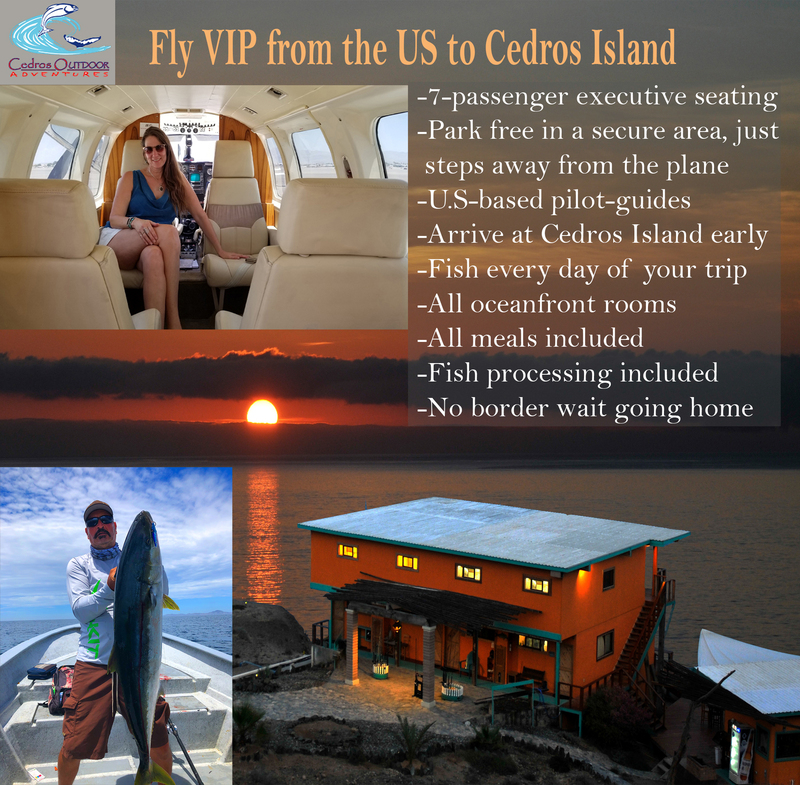 We are the only outfitter offering transfer on a twin-engine plane (traveling at about 200 mph), and the only outfitter offering flights from the U.S. Access Cedros’ remote and abundant fishing grounds fast. Typically under 3 hours from your car to our door. Our US-licensed pilot-guides have extensive Mexico experience. They will assist you through every step of your journey from the U.S. to a quick stop to clear customs and onto Cedros Island, MX. Gear allowance 40 lbs. per person going down. Gear and fish allowance 90 lbs. coming back. Fish every day. Premium Guide Service clients typically arrive between 10:00 and 10:30 a.m. Fish the rest of the first day, up to 12 hours each full day, and a half-day before you depart. Fish in 26 ft. super-pangas and go for the fish YOU want. (3-per panga standard. 2-per panga subject to availability). New in 2019: Commercial-grade vacuum sealing included in the PGS package. Stay in all oceanfront rooms or private cabins with private bathrooms. (Double or triple occupancy standard, depending on group size. Single rooms subject to availability). Enjoy full, hot or cold breakfasts, lunches to-go, and four-course dinners. All meals customizable on request. Avoid the border wait on return. Typically U.S. customs at Brown Field airport takes only a few minutes. Pull your car up to the plane, unload your gear and fish, and head home. Easy-peasy!